2. Write 8 facts about your character. 1. Dark Inferna's civilian name is Nancy Brenton. 2. Nancy is a natural redhead. 3. Nancy is a lawyer and owner of a big law firm. 4. Nancy was made a partner of the law firm and she killed the other partners with her fire powers for control of the law firm. 5. Nancy's rival in the courtroom is Melinda Crane. 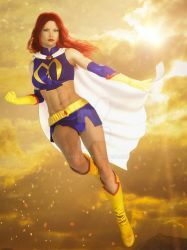 Dark Inferna's nemesis is Mindy Marvel. She doesn't know Mindy Marvel and Melinda Crane are the same person. Also, Mindy Marvel doesn't know Nancy Brenton and Dark Inferna are the same person. 6. Dark Inferna thinks she's better than most people. 8. As Dark Inferna, she can be cool to the touch if she wants to be. hotrod5 has started a donation pool! I would like to keep having a premium core membership. Would anyone being interested in a Your Character Here type commission based on the Attack of the 50ft Woman image I did recently? I'm thinking it would cost about $15 USD. I was packing away my Xbox 360 games and I found a Xbox Live Gold 12 month membership card unused. Score! I tested out streaming with Picarto making art with Poser. Having trouble with settings with talking on my mic and playing music in the background at the same time. Need to fiddle with those audio settings to get them where I want before I do an official stream. Just found I still have City of Heroes installed on my computer. *Sigh* I had some good times with that game. Now I'm not sure if I should uninstall it or not? Thank you for all your support and putting up with all the threats and teasing from Poison to Soviet Superwoman. I love the teasing old friend! Thanks for the pic and then faving it.